All of God’s children are welcome in worship! We know it can sometimes be difficult to worship with young children, so we want you to know that you are welcome and we are glad that your whole family is with us in worship. Click on the image to the right for suggestions for making it easier and meaningful for your whole family. In the narthex (lobby) of our main sanctuary, you will find canvas worship bags. These bags contain quiet activities such as puzzles, coloring books, and more that help young people engage with the story of God during worship. Children’s Worship is offered at the 11 am service. Children ages 3 to 5 are invited forward after the prayer of the day and led to special children’s worship space. Children are engaged in the scriptures and activities. During the 11 am services, children return to their families during the sermon hymn. Please note there is no Sunday School during the summer. It runs from September to May. 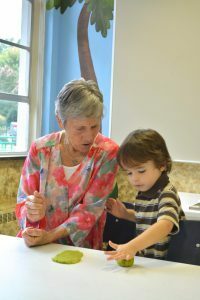 Our youngest disciples are invited to a special Sunday school class for our 3 & 4 year olds with amazing teachers like Judy. These teachers help students explore the love of God through story, drama, song, art and more. This is held in Room 121 from 9:45 – 10:40 am, September- May. Children’s Centers happens from 10 am-10:45 am in the ARK. Learning centers allow our kindergarten to 2nd graders the opportunity to explore a classic Bible story through different centers. Each week, kids have the option to engage in crafts or science. If your child is at 9:27 children’s worship, we will move them into learning centers at 10 am. The nursery is available during all three worship services and the Sunday School hour. Child care is provided for infants through age 5. The nursery is staffed by a paid attendant as well as rotating parent volunteers. The nursery for 11 am worship is located in the downstairs of the Sanctuary building. Nursery for all other services is located in the downstairs of the Faith Center.